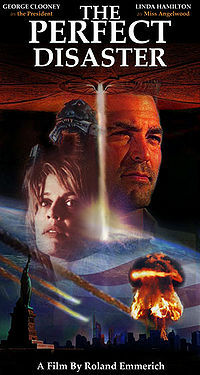 The movie poster for the 2000 film adaptation of the 1991 perfect disaster. Whoops! Maybe you were looking for 2012? A Perfect Disaster is a highly unlikely confluence of events that creates a disaster that can be said to be perfect, both in its intense visually impressive destruction as in its ability to isolate small groups of people strewn together from different walks of life and develop their characters in a meaningful and entertaining way. A perfect disaster will almost certainly pressure all lingering unresolved romantic tension into a conclusion to coincide with the end of the disaster itself. The only confirmed perfect disaster in recent history occurred in October 1991, when several reasonably unlikely events of moderate destruction and dramatic potential coincided into a highly unlikely, yet strangely believable event with massive awe-inspiring destruction, a large not-too-gruesome death-toll and intense dramatic development in several small groups of good-looking survivors. The event was adapted into a movie, The Perfect Disaster, in 2000 by Roland Emmerich. The events surrounding the 1991 perfect disaster can best be described by focusing first on those people that predicted the disaster and tried to get the president to listen to them, but couldn't do so before it was too late. At 8 am October 1, 1991 Dr. Spiel Hakker, seismologist turned paleoclimatologist and amateur computer analyst spotted on his 3D output of several very scientific computer models, something highly disturbing. He quickly realized that if events would transpire according to his complex models, a perfect disaster might strike, within the next decade, but possibly that very day. As Hakker rushed to the White House to inform the president, around the world small signs of the oncoming disaster started intensifying. Near Greenland a large piece of ice broke off an ice shelf, killing a vacationing family. In New York, the ongoing rainstorms caused major traffic jams. Up in space, the approaching alien fleet cast a frightening shadow over the moon's surface. In Atlanta, a scientist at the Centers for Disease Control was bit by a monkey recently brought in from the African jungle to study emerging diseases and began to develop a high fever and flu-like symptoms. In Chicago, faulty wiring in the Nakatomi Glass World Sky Center began to start several unnoticeable fires. In San Diego, an infuriated Tyrannosaurus Rex suddenly appears downtown, chasing groups of terrified witnesses around. To provide the most accurate description of how the disaster unfolded, it's best to introduce the seemingly random set of people that would later on be thrown together in a battle for their own survival. That morning up-and-coming jet pilot and part-time firefighter Jack Bunter was saying goodbye to his pregnant wife with whom he had just bought a suburban house. New York vagrant Twevah was trying to find some shelter and food for himself and his pet pig Skippy. Meanwhile straight-A student Jaymie Banalson and her ethnic-looking friend Hyundai entered the Metropolitan Museum on a class trip. Their classmate Sam Motorola, misunderstood teen rebel was being reprimanded by his teacher Miss Angelwood. As these people went about their ways, unaware of the lingering doom, Dr. Hakker had arrived, with his father (who was visiting that day) at the white house, and was trying to get an audience with the president, while assuring his ex-wife on the phone that he would be picking up his 17 year old son later that day. However, his attempts to explain the situation to the heroic and noble president (portrayed by George Clooney in the movie) were blocked by the bald, treacherous and self serving vice president Lick Ballsy, who dismissed his warnings as environmentalist, wackjob conspiracy theories. The president attacks a tornado in his F16. At that point the various intense and drawn out visuals of the disaster began to manifest themselves. First, seventeen twisters hit Los Angeles, destroying several important monuments and hurtling numerous schoolbuses through the air, killing people in almost comical fashion. As LA was left decimated, the alien fleet attacked Washington DC, destroying every single property with monument status, including the White House, where Dr. Hakker and his father were just able to escape with the president. The vice president, however was gruesomely and painfully killed. While escaping the decimation of Washington, Dr. Hakker carefully explained to the president how all this awesome destruction could be caused by one single improbable confluence of events and why it was all his fault for not listening to him sooner. While the trio traveled to a secret underground government base the disaster hit New York. The group of random heroic individuals, introduced earlier, was now trapped in the Metropolitan Museum by the flood from a gigantic Tsunami, as well as a meteor shower, three rabid wolves, a volcano and a small but highly poisonous newt. As the disaster raged on, they struggled to keep warm, fight of the wolves, find food, avoid the lava, not eat the newt, and suppress their romantic feelings for each other until the climactic conclusion of the disaster. Back at the underground base (after the destruction of Las Vegas by an earthquake, Denver by terrorists and Seattle by a black hole) Dr. Hakker had a moment of inspiration (brought on by a seemingly innocent comment from his father). The only way to end the perfect disaster, he surmised, was to use the perfect solution. This perfect solution would end the destruction in one final climactic confrontation, cause several people to sacrifice themselves heroically and would conclude everything fast enough to reunite the people who had had their characters developed by the disaster. The president acted decisively and immediately implemented the solution. As the dust settled, the few brave survivors of the disaster emerged from their shelters, staring at the various romantically lit piles of rubble that were once their cities. The disaster ended with a speech by the president (still in full combat gear from the attack on the alien mother ship) linking the disaster to various sociopolitcal issues, such as the environment, immigration, tax reform as well as American values in general. Dr. Hakker was at long last reunited with his wife and son, Jack Hunter was reunited with his wife, who had been erroneously informed that her husband had died, when in fact it was Jack's wingman Banal who had died. (Banal also had a wife, but a decidedly less beautiful one.) Jaymie finally confessed to the rebellious Sam that she had fallen in love with him after he had heroically saved her for the fifth time from one of the disaster's many incarnations, and together they mourned the death of Hyundai, who had been mauled by the rabid wolves. Dr. Hakker, Sr., unfortunately, had Alzheimer's, and was sent to a nursing home. In Great Britain, things looked even grimmer as animal rights activists accidentally released an out-of-control "rage virus" whilst liberating a group of chimpanzees from a scientific laboratory. This just happens to coincide with subway diggings in London which had unearthed a vicious, ancient race of fire-breathing dragons that has rested in the bowels of earth ever since the time of the dinosaurs. Within days, the fiery dragons and the rage virus destroyed civilization on the British Isles as the dragons torched the cities whilst the virus quickly zombiefied nearly the entire population, save those who evacuated themselves to France in time. However, even this did not give the few survivors much pause as the Eiffel tower, the tower of Pisa and several other instantly recognizable monuments around Europe were struck by small meteorites, floods and minor earthquakes. 28 weeks later the rage virus had gained foothold in continental Europe as a boy carrying the rage virus as an asymptomatic carrier was brought to France on board a helicopter, resulting in the infection spreading across the continent. In Italy, a meteor carrying severe biologic contamination crashes nearby the river Tiber, resulting in utter ruin of ecosystems worldwide as the highly toxic plant called Tiberium spreads across the Euro-Asian continent. 28 minutes later, the movie ends. It should be noted, however, that while the disaster caused major destruction in Europe, no dramatic character development or selfless acts of heroism took place there (especially not in France). 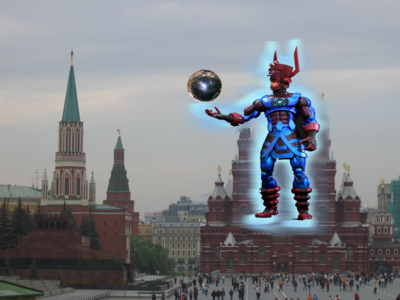 Disaster hits Moscow as Galactus, the Devourer of Worlds, arrives at the Red Square with the intent of devouring all of earth. 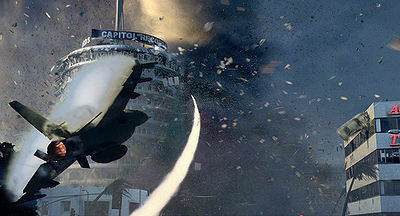 Roland Emmerich reportedly orgasmed spontaneously when the disaster was first described to him. Later research showed that approximately 320 000 small groups of survivors were involved in the disaster with an average of 8.4 people per group, 1.4 black people per group, 6.3 teenagers per group and 1.2 people per group had been non-fatally injured, requiring others in the group to carry them or otherwise assist them nobly. "Billy, get out of there! The storms have collided!" The president to his son. "It ain't over 'till the fat lady pings." Dr. Hakker, assuring the president that his solution will work during a brief moment of anxious silence after its deployment. "Get the heck off my planet!" The president, taunting one of the tornados. "If only I'd put more effort into protecting the environment! AAAUUGGGHHH-ar-ar--yeeaauugghh...!!!" The vice president's last words. "I--AM--GUYABADOR!!!" The courageous cry of Dr. Hakker, Sr. The dog survives at the end. Perfect Disaster is part of Uncyclopedia's series on Mass Media.